Shorter days mean less time daylight hours and these fast and delicious pan-seared pork chops will help you squeeze every last drop of daylight out of this autumn season. Who wants to spend any more time in the kitchen than necessary, especially during the most colorful time of the year? These autumn-inspired and pan-seared pork chops can be on the table in 25 minutes. We use thin cut pork chops for this harvest pork. Doing so allows you to enjoy all the great flavors of autumn and pork while taking less time to make. What’s in this Pan-Seared Pork Chops Recipe? Use thin cut pork chops for this harvest pork chops recipe. Start this pork chops recipe by searing some thin cut pork chops. Our temperatures are falling. Quickly. Our number of daylight hours are diminishing. Rapidly. We all know what this means, it is almost fall, and I’m not fighting it anymore. Tent the pork chops with foil and set aside. Sautée some apples and onions. To autumn I say, “Bring. It. On.” Scott made the entire process dramatically more palatable, literally. This evening he put this meal together on the fly, and it is too delicious not to share. With gratitude and pleasure, I once again turn the keyboard over to him. Add a cup of white wine to the pan. We prefer using a dry white wine like sauvignon blanc. Hmmm, great question. I wasn’t sure. I had gone grocery shopping on Sunday and picked up our weeks worth of meals. What I should say is that I picked up some staples like milk and bread and some other things that were on sale or just caught my eye. A warm blend of spices and brown sugar are added to the pan. I could not walk past the granny smith apples without putting them in the cart. I just love them, delicious. After a survey of the meat counter, thin cut pork chops called to me. I know that they are quick to cook and very versatile. Little did I know that they would become the base and the answer to the question that was posed to me earlier this afternoon. 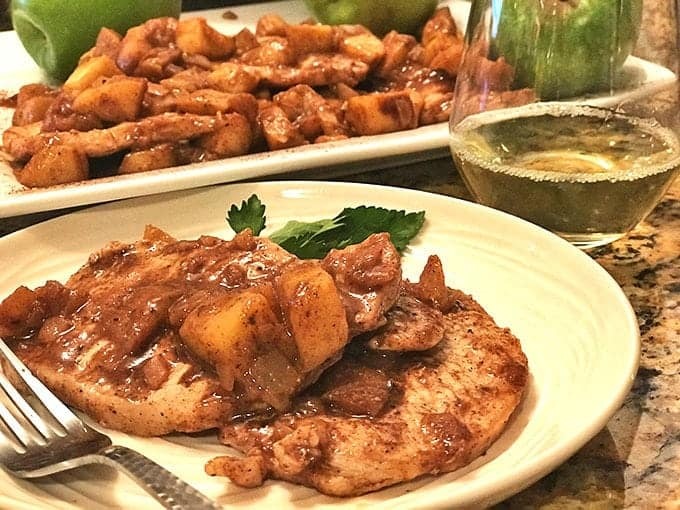 Granny Smith Apples give just the right amount of tartness to this easy pork chop recipe. 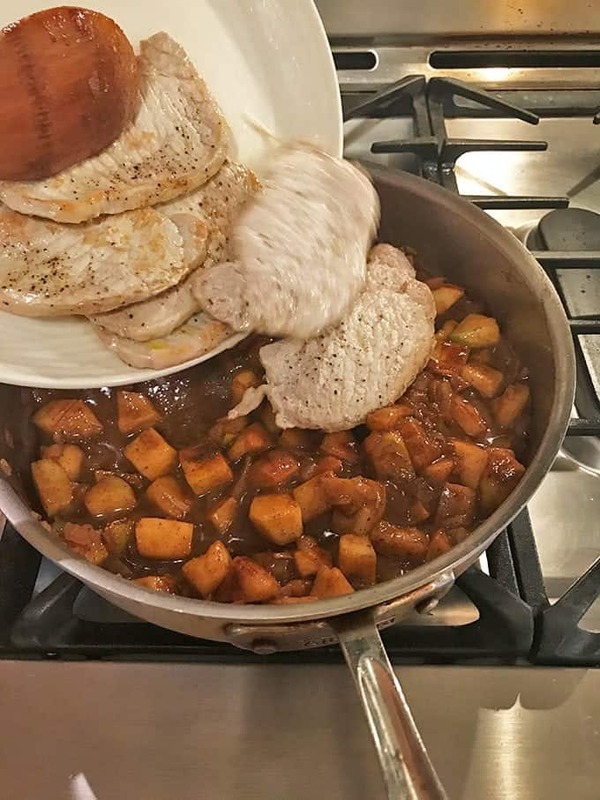 When we got home from work, I went into a frenzy to see what I could “throw” together to accompany the apples and the pork. Fall was on my mind, with the weather being a bit cooler this week. When I think of fall, I think of things like freshly baked apple pie. 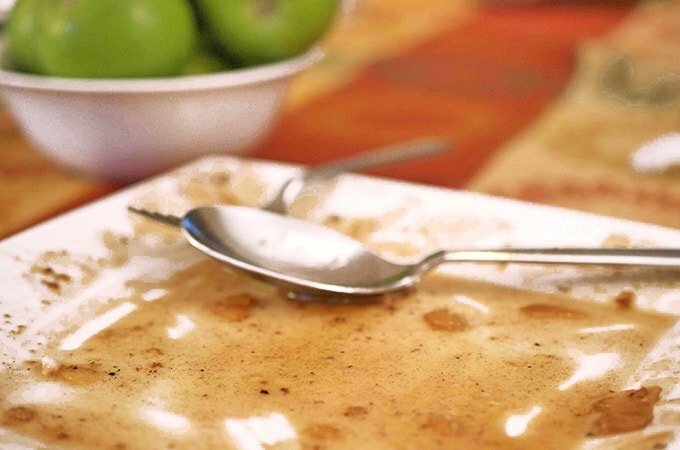 I knew that we could not have apple pie for dinner, but I thought that the idea of a sweet and savory sauce for the pork would be delicious. The kids would surely love it and so to the pantry I went. I wanted to find anything that screamed fall to me. Cinnamon, cloves, brown sugar. Perfect, I thought. But I also needed something to make it savory as well. White onion, poultry seasoning, apple cider vinegar. That would help to balance out the flavors. White wine, too, seemed in order. Add a cup of chicken broth to the pan. Besides, what a great excuse for me to enjoy a glass. It’s the least I deserved after a day of work, right? Right. Now, I was in uncharted territory. The glass of wine was helping, but I wasn’t sure where I was going with this recipe. I knew that it was going to be a little of this and a little of that, but what would happen if it was too little of that, or too much of this? Return the seared pork chops to the pan. One thing for certain, there was too much worry. Today was not that great of a day, with a lot of stress at work, as sometimes can happen. Cooking normally calms me down and puts me in a much better mood. “Have fun with it,” I thought, and so I dove in feet first and just enjoyed the process. As I sauteed the pork chops and began the process the house started to warm. Then the onions and the apples were added, followed by the poultry seasoning, brown sugar, cinnamon, and cloves. Make up a platter of these savory pork cutlets in no time. Wow, my shoulders began to drop. The house was smelling like fall. Instead of the boys asking when dinner would be done, they started to make comments on the kitchen aroma as it made its way throughout the house. As the wine and apple cider vinegar was added to create the sauce, the dish pulled together very nicely and as a bonus, very quickly. Things were looking up. We sat at the table as a family and talked about the day. The events of school and work, the lessons we learned, and what we expected in the upcoming days. We enjoyed these pan-seared pork chops flavored with the taste of autumn, but even better we enjoyed each other. Harvest Pork Recipe from Platter Talk. Isn’t it great what happens when you don’t stress about what is for dinner, and you just enjoy the process and your family? This fast and easy pork chop recipe is a must try. Conversation smiles, and even laughs are guaranteed. Don’t expect any leftovers from this autumn-inspired pork chop recipe. 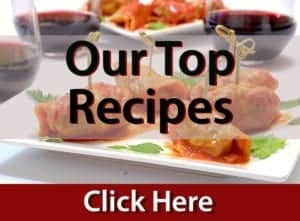 Looking for More Way of How to Cook Pork Chops? Try some of These! 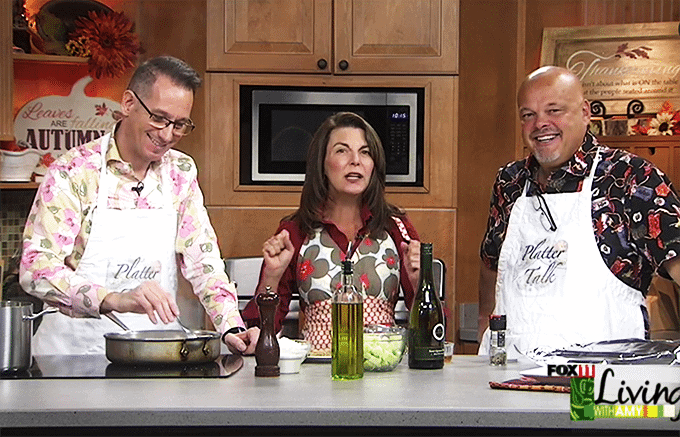 Watch the Platter Talk Guys prepare this recipe on live television. 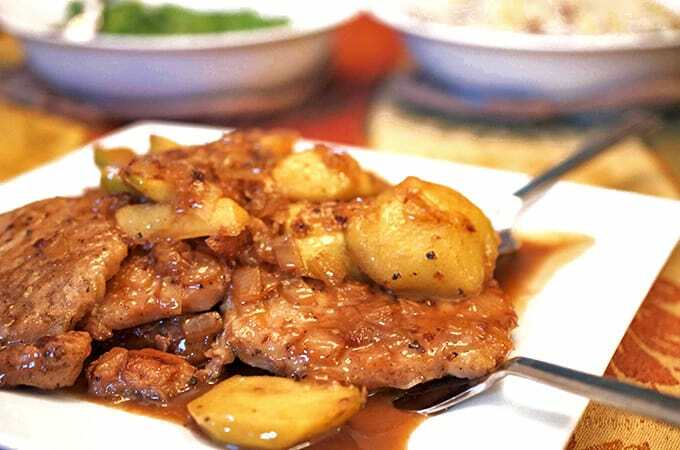 This fast and easy pork chop recipe from Platter Talk features pan-seared pork chops, cooked with Granny Smith apples and other warm fall flavors. 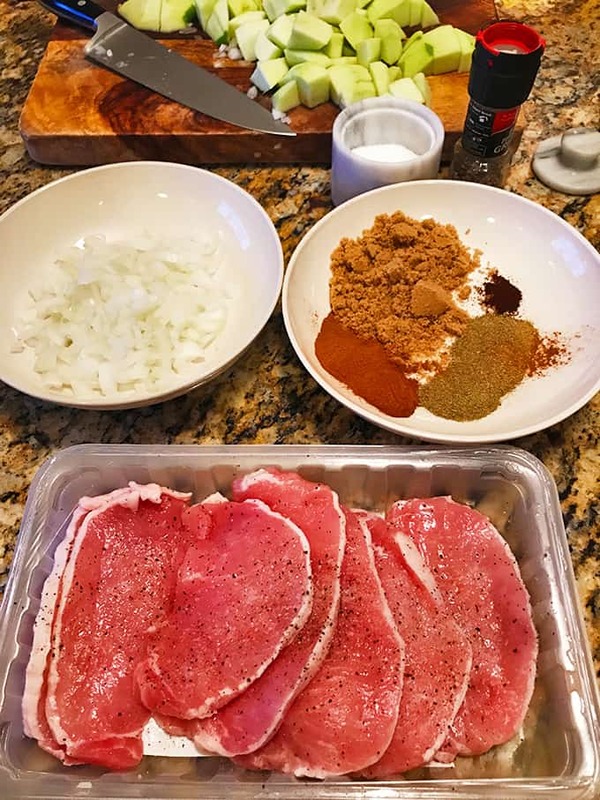 Salt and pepper pork chops. 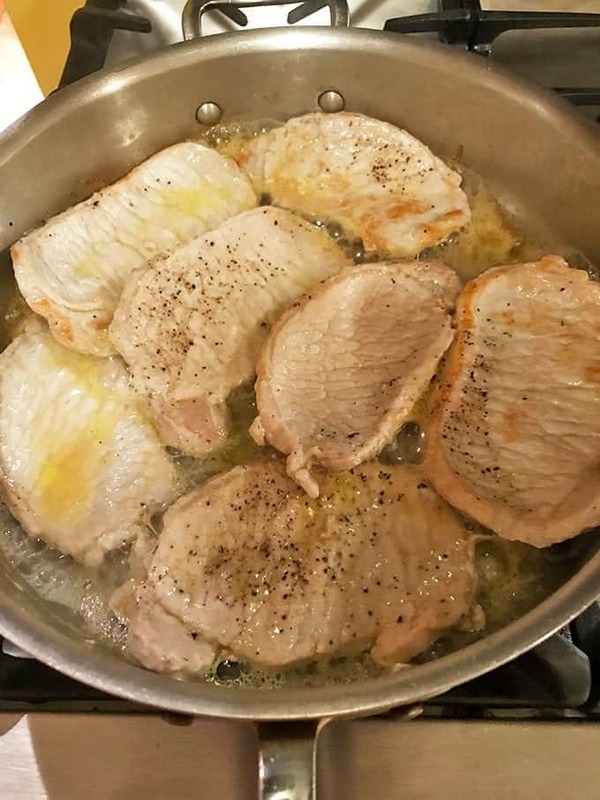 In a large saute pan add 1 tablespoon of olive oil and saute the pork chops until browned, over medium heat. Remove the chops, set aside and tent with foil to keep warm. 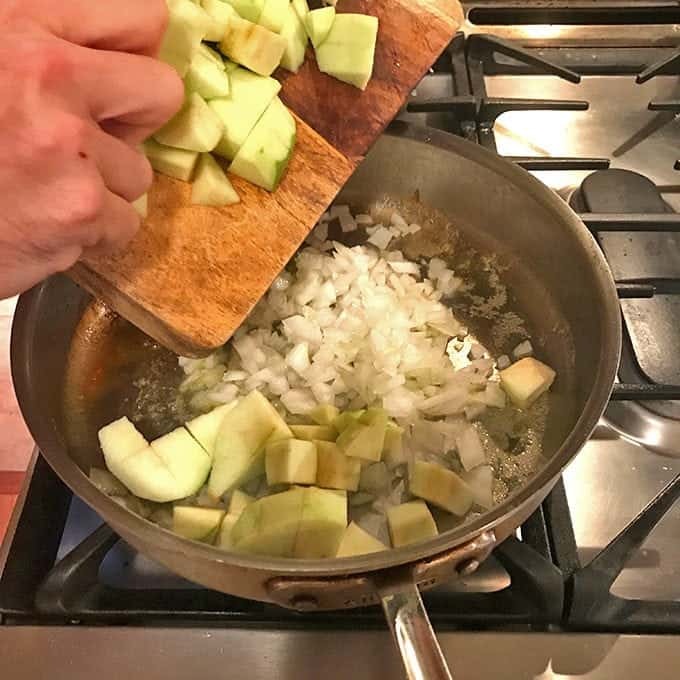 Add remaining tablespoon of olive oil to saute pan and then add the onions and apples. Cook over medium heat until the onions are soft and translucent being careful not to overcook the apples. Add the wine and bring to a boil scraping the bottom of the pan to deglaze. 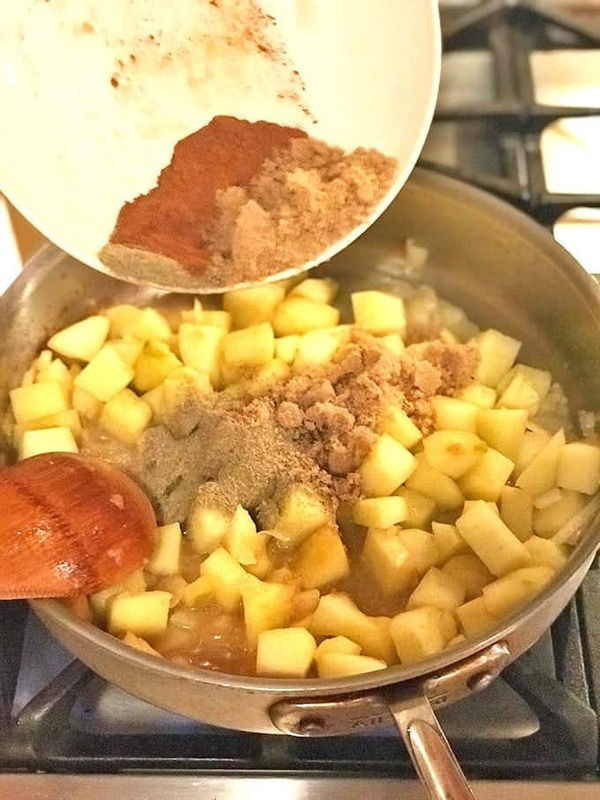 Reduce heat to a simmer and cook for a minute or two and then add poultry seasoning, brown sugar, cinnamon, ground cloves, and apple cider vinegar. Stir in broth to desired consistency. Cook and stir until mixture starts to thicken. Return the pork chops to pan and cook on medium-low heat until the pork chops are cooked thoroughly. Pin this pork chops recipe for later. Oh goodness, this pork chop dish sounds absolutely amazing! I love everything apple and fall spice but put this on top of a versatile meat like pork chops and I’m sold. We will be making this dish this week for sure. 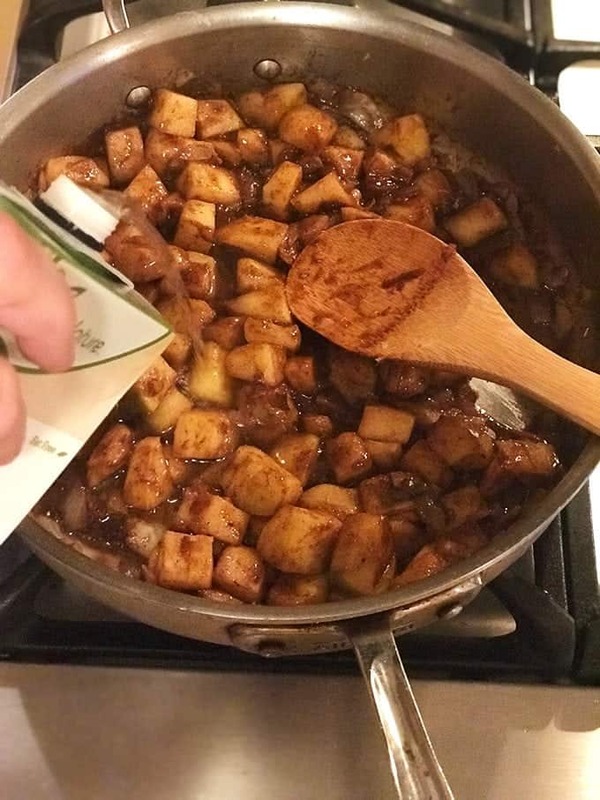 Pork and apples is such a great combination. I just love this kind of dish, the apples means my kids will devour it too! I love adding fruits with pork and this looks like a winning recipe. I think we would enjoy this very much. 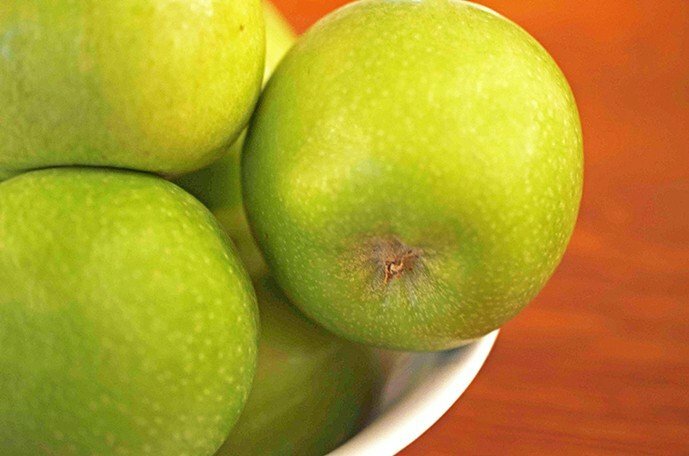 I love Granny Smith apples. It’s been forever since I’ve eaten some good pork chops and these looks quite tasty! What a great family dinner! 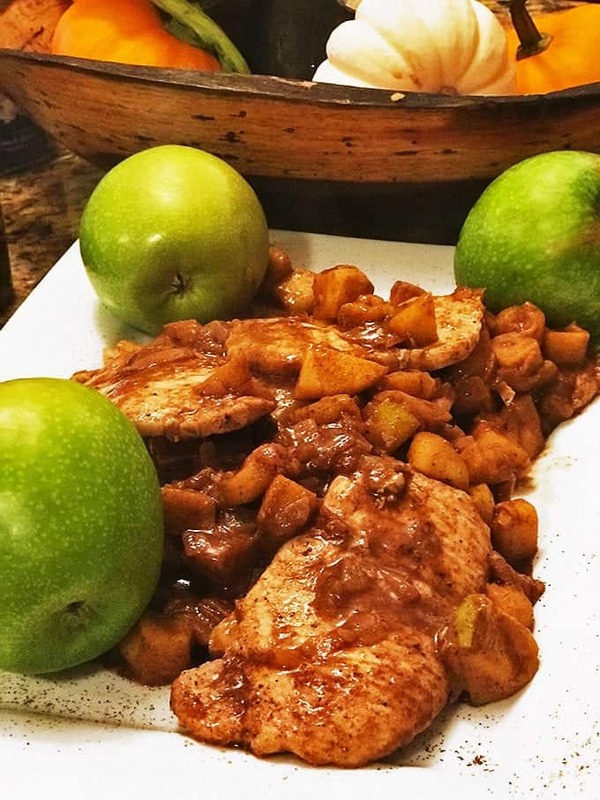 I’ve always wanted to make a pork dinner using fruit and apples would be ideal!! I’m pinning this recipe to make next week. 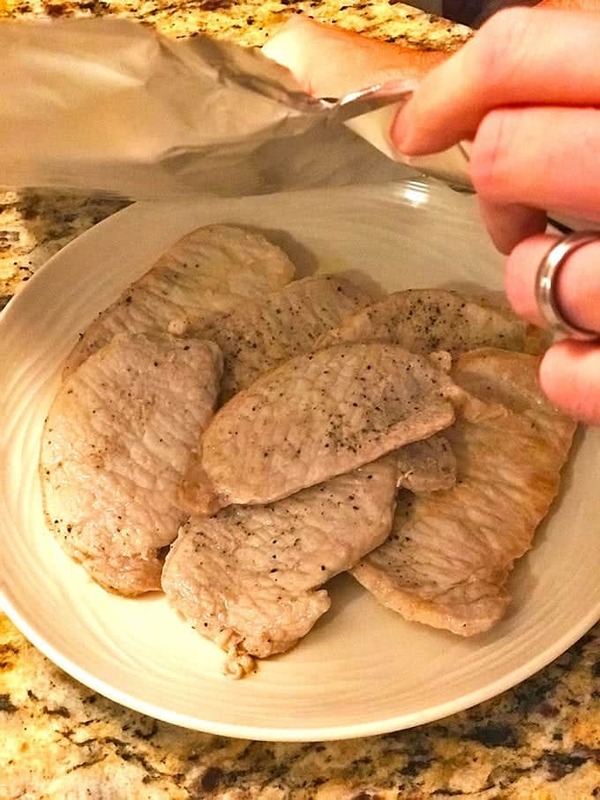 These pork chops look wonderful! What a flavorful fall dish..I could go for this for dinner tonight! Oh God, this pork looks incredible! My whole family would go crazy for these! I like all the ingredients in it. This is a great idea for dinner. This is really a great recipe. 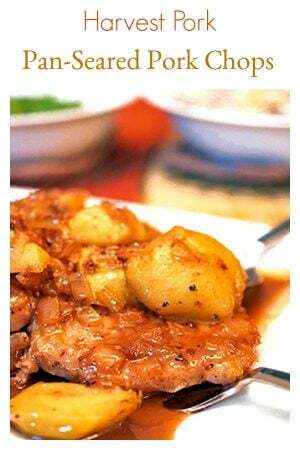 Mahy,I think your whole family will enjoy this pork chops recipe! Wonderful idea!! Thank you for taking the time to leave a comment! Oh, I am looking forward to feasting on pork with apples this fall and this dish is now one I must try. 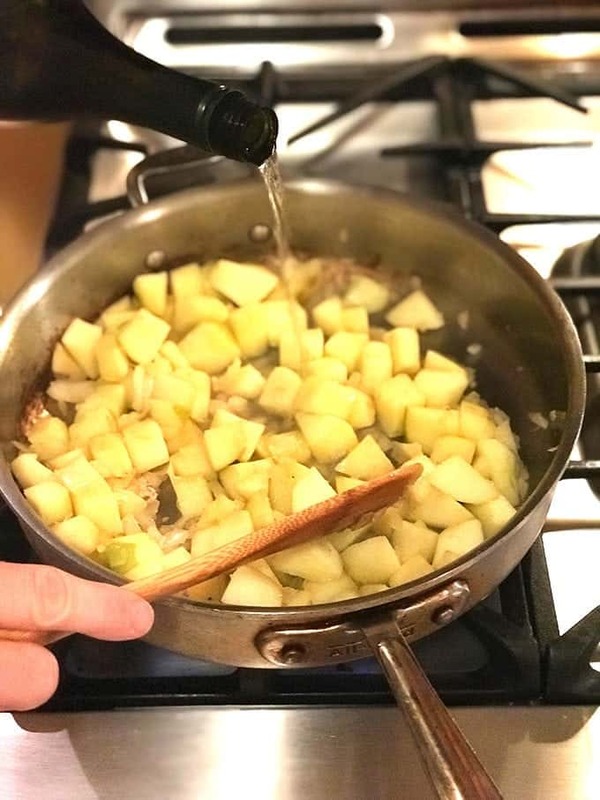 Scott, you have created an incredible autumnal recipe here with those spices and the addition of the wine along with the zip of the cider vinegar. Mmm. Thank you, my man. And, thank you Dan for featuring Scott! Thanks for dropping by and of course the wonderful comments. Hoping you have a nice fall weekend lined up!! And now I’m officially hungry! I love the combination of pork and apples – they pair so wonderfully together. Haha – love that last picture with the empty plate – though I think I might have licked it clean as this looks great – kudos to the chef! Love the combination of sweet and savoury in this dish! Your comment is too funny, because when I thought no one was looking while I was clearing the table, I just might have licked my plate!! Thanks for dropping by, and as always, thank you for leaving a comment!! The temperature has dropped very slightly here and I certainly noticed how quickly it gets dark nowadays. Anyway, this is such a classic combination and the pork looks so juicy! I should be asking you if I can come over for supper? 😉 Well done Dan! Thanks for the comments, and you are welcome to join us anytime you find yourself in Wisconsin! Happy fall!! Oh yeah! Now if that isn’t comfort food, I don’t know what is… This looks like one helluva scrumptious meal, Dan. 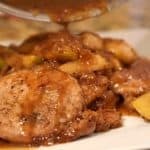 Pork and apples is a classic combo and one of my favorites! Thanks for the comments, and I’m with you all the way on this one! I usually just bake with apples, but apple and pork is such a great combination! Yum! These two really do go together well. Thanks for the comments and I hope you give this one a try!! 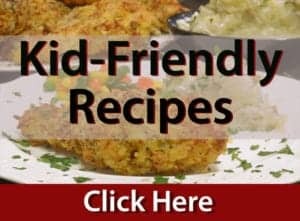 I am loving this recipe – hello Fall if it means great recipes like this! YUM! My sentiments, exactly! Thanks for the comments! I am not liking these shorter days or cooler temperatures…mostly the shorter days are what depresses me 🙂 This looks YUMMMM-O! Pork and apples is a sublime combination. Looks delish! Thanks for leaving a comment. Dishes like this one make it easier to welcome the fall season! Give this one a try, and thanks for the comment!